The best thing about this area is the complex coastline. You’re virtually guaranteed a wave, no matter what the wind or swell direction dishes out. The waves typically range from 2-8 feet. Bigger swells coincide with trade winds from June to September (peak season), and smaller swells with lighter winds during March to May, and October and November (shoulder season). Most of the waves fall into the intermediate to advanced category. The slab out front is a beast suited for hellmen and hellwomen. Leftovers is a fast, fun left-hander that previous guests have described as a less crowded version of Bingin. The Peak is a perfectly backdoorable right-hand barrel, along side a thick lipped left. Krui Bowls is a bowly, barreling left. Krui Left is one of the most consistent and high quality waves in the area with mechanical barrels and a long, workable wall. Krui Right is racy and playful. 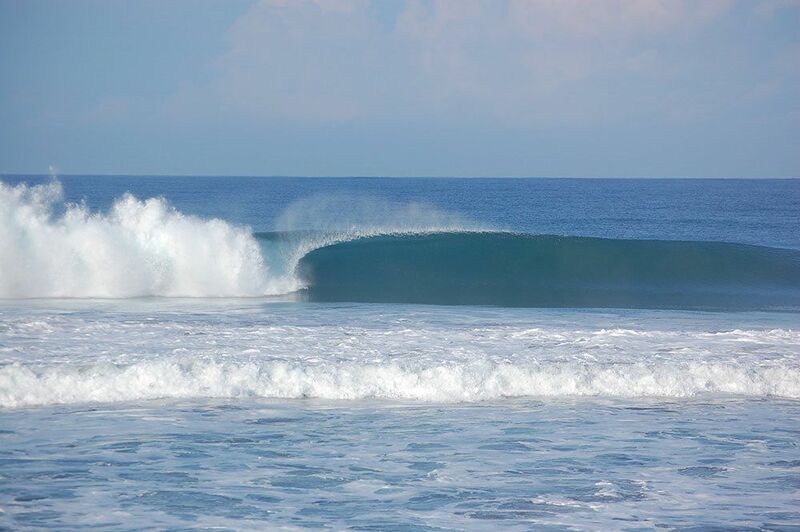 Beach breaks (Mandiri and La'ai): 15 minutes in either direction. They're both punchy, fast, and hollow. Lots of bang for your buck at any size. The most well known wave in South Sumatra is Ujung Bocor (often simply called The Point), 30 minutes south of Amy’s Place, a left-hander where you’ll score the longest waves of your trip. Rides of 200+ meters/yards are common. Another 10 minutes south of The Point is Way Jambu, also known as Sumatran Pipe, a barrel machine that's as heavy as it sounds. An hour’s drive north will bring you to Jenny’s Right, Honey Smacks (AKA A-Bomb), and Jimmy’s Right and Left (in that order), not to mention all the waves in between. Jenny's is at her best when the winds are technically unfavorable making it an amazing option to have, while the rest of the of this group fall into a "the bigger the better" category. On smaller swells, a short boat ride over to Banana Island will provide you with waves and that feeling of taking the road less traveled. Southern Sumatra is the one-stop shop of surfing. Show up with your sense of adventure and you'll be rewarded! Visit surf-forecast.com for a detailed Krui forecast, long-range outlook, surf reports, swell, and weather maps.